FootGolf Daily after 10:00 a.m.
Soccer cleats are not permitted on the course; tennis shoes only. Tee times may be made up to 7 days in advance. When you call to make your reservation, our staff will ask the number of players in your group and the day and time you would like to play. We will do our best to accommodate you. FootGolf is an incredibly fun new sport that combines soccer and golf out on the golf course. Instead of a golf ball, you use a standard #5 soccer ball. Instead of clubs, you kick it! The object is to get the ball into the 21-inch diameter hole in the lowest number of kicks. FootGolf is family-friendly, great for groups, easy to learn, and fun to play. Are you ready to come Kick It With Us? The Lake Forest FootGolf Course is a 9-hole layout that can be played as a solely 9-hole round, or doubled up as an 18-hole round. You can walk or ride the course, and tee times are available throughout the day on both weekdays and weekends. Soccer balls are available to rent at the Pro Shop for $5, or you may bring your own, as long as it's a standard size, #5 soccer ball. Indoor turf shoes or tennis shoes are suggested. Soccer cleats are not permitted on the course. For more information on how to dress like a FootGolf player (and other helpful tips), head here. The FootGolf course at Lake Forest Golf & Practice Center follows the regular golf course, and players will encounter short and long pars, bunkers, and even lakes during the round. 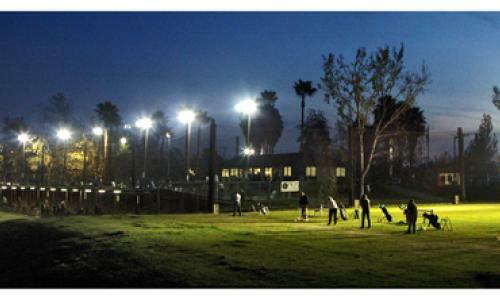 You can book tee times online from this website, or you can call us at (949) 859-1455, ext. 2.